How can I reuse or recycle out of date contact lens solution? | How can I recycle this? How can I reuse or recycle out of date contact lens solution? Here I am again with another item that you hopefully find interesting enough to put on your website. 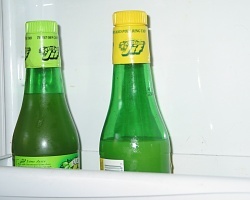 Still cleaning my cupboards :-) , I now found several out-of-date bottles of contact lens liquid. It’s the storage and insertion liquid, not the soapy cleaning stuff, although it says that it can also be used for cleaning. I can’t find any ingredients, except that it contains certain additives for conservation. Does anyone know if there’s anything I can do with it. 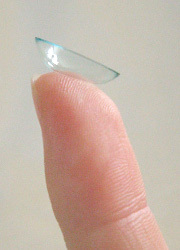 I don’t wear my lenses any more due to too dry eyes, so this is what is left. As I’m a glasses wearer, I’ve not had enough experience with the liquid to know what it could be used for – I do know that those solutions are sometimes just saline, but I don’t know if that’s the case with Petra’s stash. Has anyone else had leftover contact lens solution? What did you do with it? Once they’re out of date, can they be used for other not-so-critical things? And if so, what? As it’s such an unknown area to me, I’d love to hear your ideas for this! I keep un opened, out dated contact solution in my first aid kits. It is the perfect irrigation solution, and it does stay sterile longer than the expiration date. Some of the bottles are pretty old, but when we are camping I am comfortable using it as a cleaner for wounds. Maybe your vet or local animal shelter would take it to use. I would only offer unopened solution though. I never would have thought of that, Carol. Clever! I use contact solution as mixing medium for pigments and mineral eye shadows, or to just apply any eye shadow wet. If it’s outdated but hasn’t been opened, you can still use it this way. Keep using it! Both my disinfectant and neutalising solutions are over three years “out-of-date” but they still work fine. 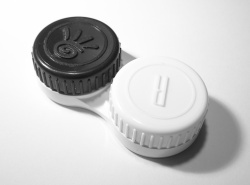 I have been using contact lenses for 20 years and have NEVER thrown away solutions. If you live in cold climes, you might use it on your windshield to prevent ice build-up. Or, alternately, after it has formed. On the glass only, to be safe. A nice handy container to keep in the car. Just a thought, haven’t tried it myself. Never heard about this.Anyway thanks for the post.